So, what's in my hoops these days? 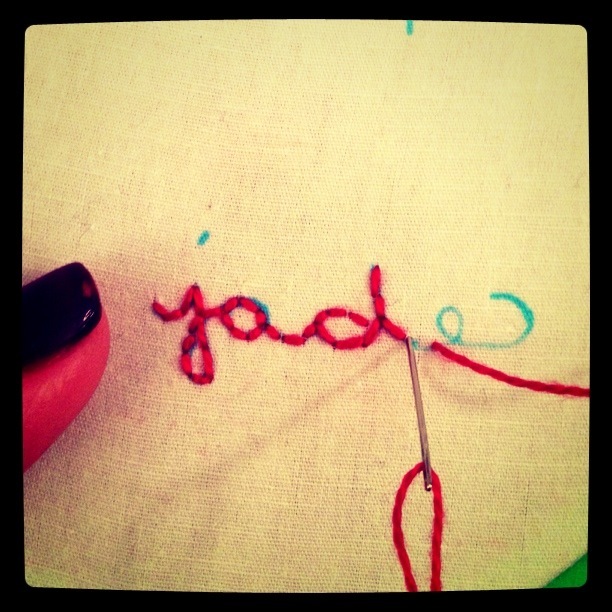 Stitching other people's words and handwriting inspires me. I'm back to working on two earlier art projects that have been in slight hibernation as I've been making gifts: The Tiny Great Curve self portrait and my Words project. Tiny Great Curve on my lap. The Tiny Great Cuvre is mostly an experiment in texture stitching and using grades of similar color to make shapes around the curve of my hip. 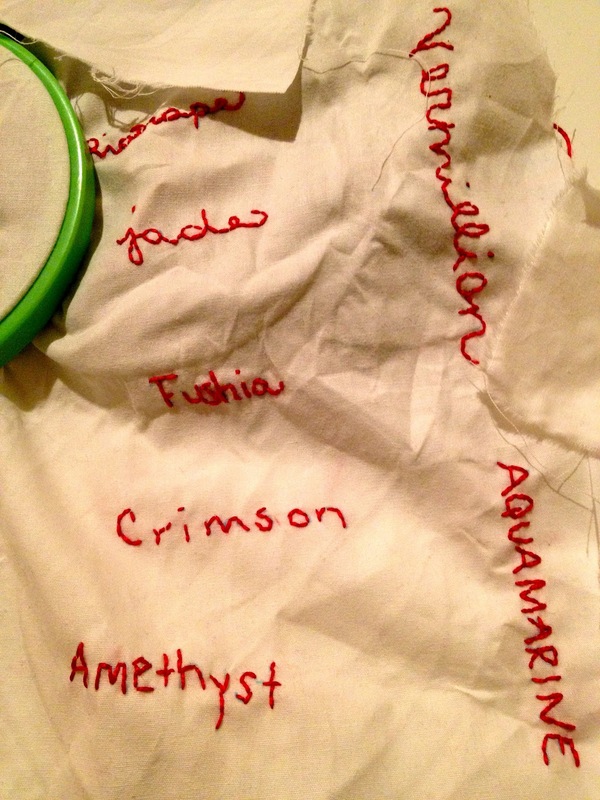 I've stitched and pulled out my stitching several times. As frustrating as that can be, it is OK because it is a learning process. And despite the challenges of redoing the same curves over and over, I'm enjoying watching the shapes, color and textures form on my fabric. This piece is an image of me, just for me. And there is so much freedom in that. Box of flosses and thread for the Tiny Great Curve. The piles of words continues to grow in my boxes. 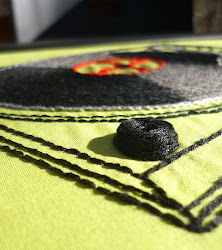 I was in Miami recently and saw (again) The Record exhibition at the Miami Art Museum. (It originated at the Nasher Museum of Art at Duke University, where I saw it in 2010.) The sketches of Japanese artist Taiyo Kimura gave me some ideas about how to organize the batch of 23 words I've been working on relating to color. Focusing on 23 words for colors. 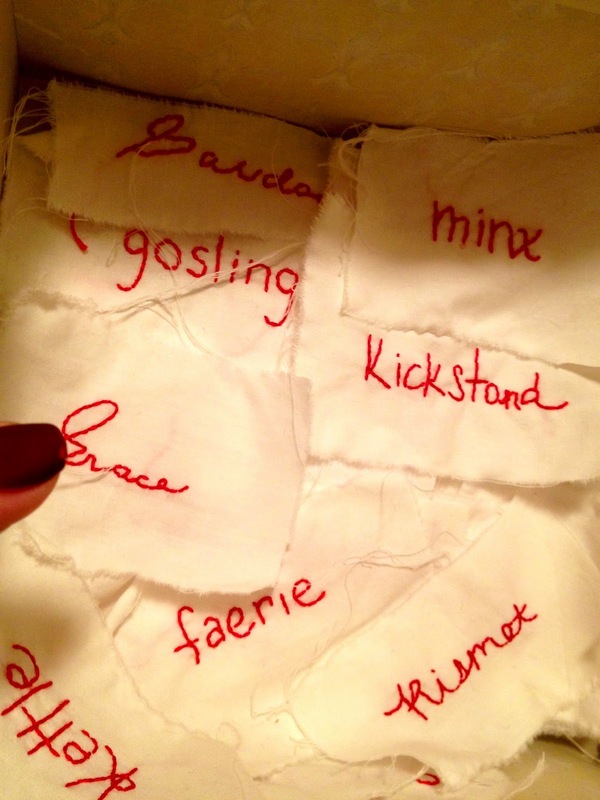 The number 23 has personal significance to me and bringing that number to these little scraps of fabric and the isolated words they contain has helped me see a pattern. And I love patterns! More to come with that. and ready for new adventures. In addition to these art projects, I have sketchbooks filled with ideas. And I have the summer to play with them. This is exciting to me. Headed to Austin tomorrow to spend time with my brother's family, including my two teenaged nephews Kels and Hudson. 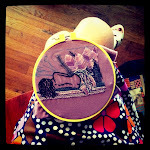 I will be out in the world stitching and collecting ideas and connecting to the people I meet, but new and old. And my hoops with fill up even more. As will my heart. 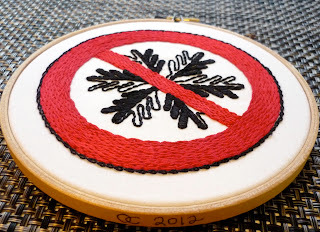 Do Not Flake on Me is done, sent and delivered to the Northern California stitch artist Lisa Leggett as part of the Phat Quarter Spring Swap from MrXStitch. 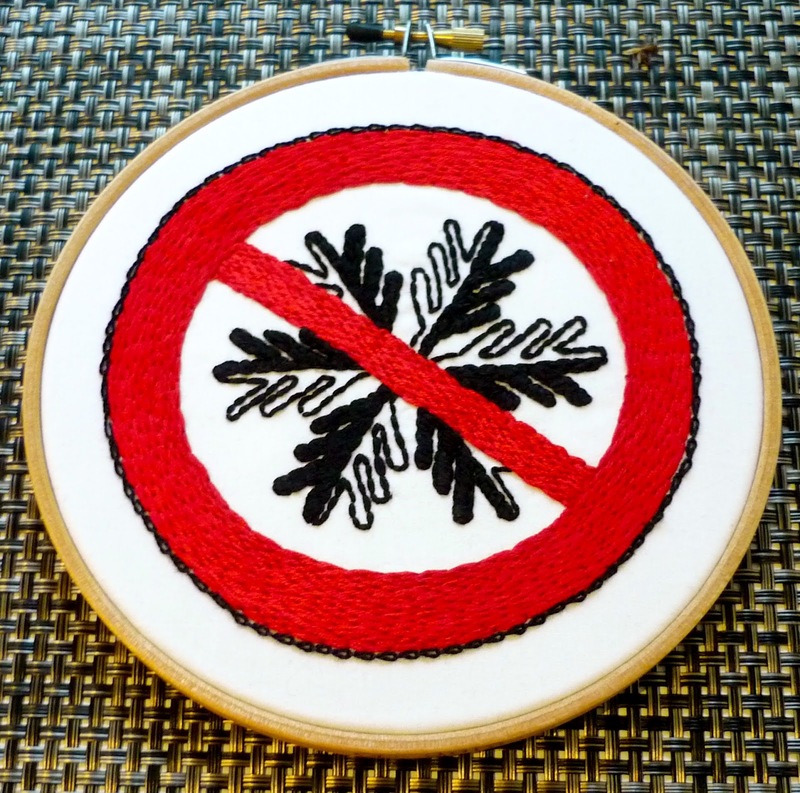 It was great fun to stitch up another "Do Not" embroidery. 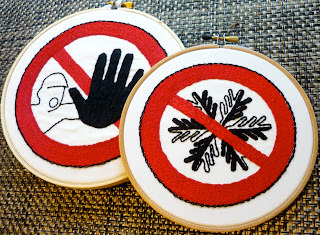 I've written here before about how much I love taking the hard graphics of hazard signs and turning them into soft stitch. 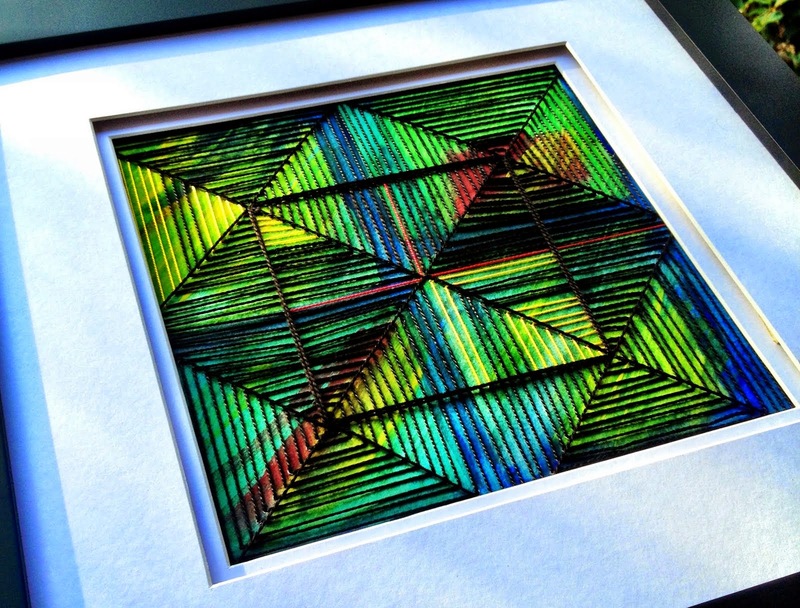 This piece reminded me how much that aesthetic appeals to me. Do Not Flake on Me snugged up to Do Not Enter, 2010. 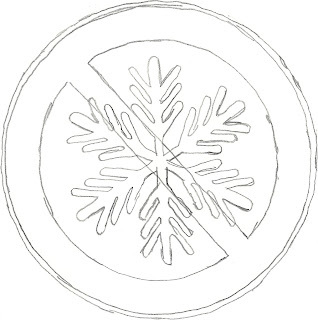 Yes, it's a snowflake and a prohibition circle. I have come to hate the cold. Living alone for the first time in my life, I negotiated the darkness and chill of my first winter by myself in the world. It was hard. Even though this was a mild winter, I spend far too much time shivering, wrapped up in an electric blanket in my poorly insulated apartment. As I was stitching the piece I wished that the cold, dark nights of winter be gone, both literally and figuratively. 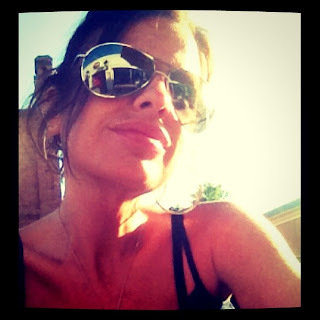 Let it be Spring again and, dare I say it, Summer. Let there be warmth in the air and in my heart. Let there be music and friendship. To much heartbreak in recent years. Let the winter be gone. 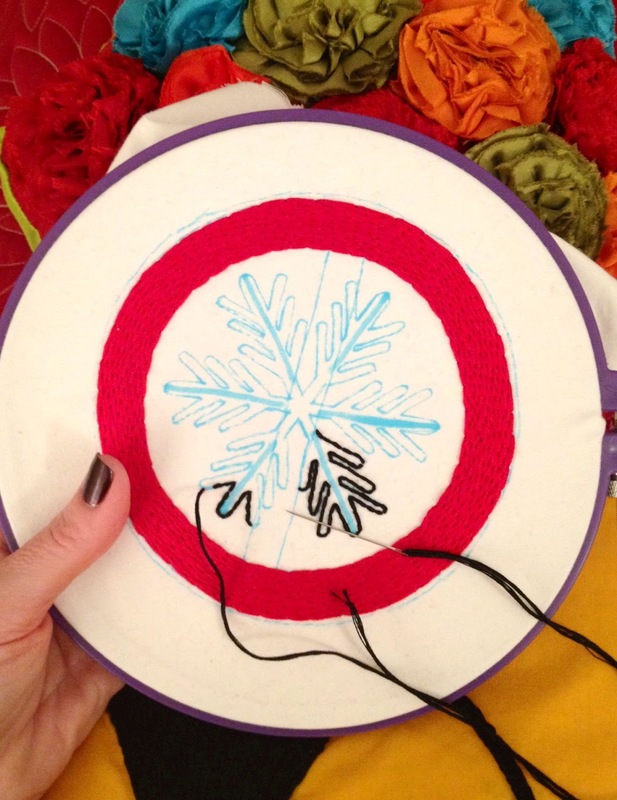 Thick red fill stitch surrounded by fine gauged chain stitch. And it is gone. There is warmth, again. A fragile warmth, but it's building. And the warmth is coming from me. 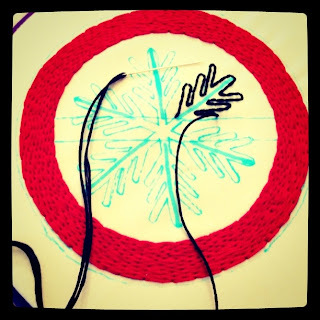 I am making it for myself, with the help of my friends and family. And I am hopeful. 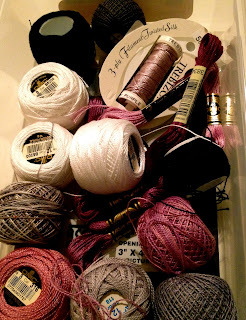 Happily, I have lots of Stitch-speration in my life at the moment. Wild colors and outlines at CAM's ArtHouse party. O & Andy. 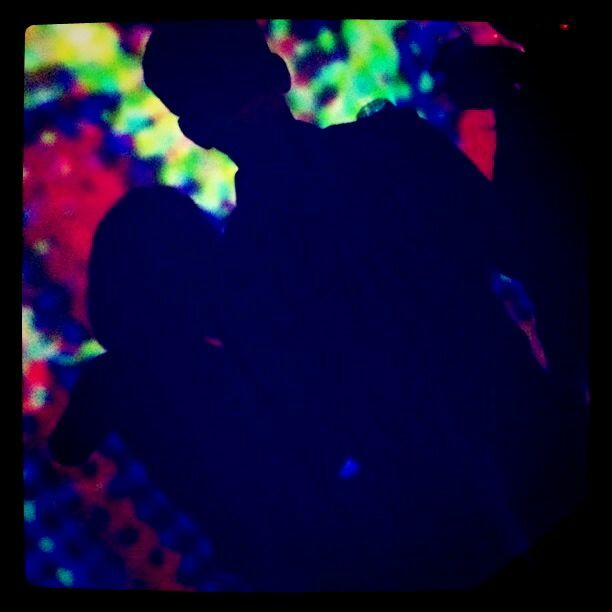 On Friday I attended the uber fun ArtHouse 2012 party at CAM Raleigh, the year-old contemporary art museum in Raleigh. Aside from enjoying myself wildly (chatting with break dancers, pulling on the mustache of an Hunter S. Thompson wannabe, having a custom, airbrushed trucker hat made for me by an artist, speaking to everyone who caught my eye and grooving with my seriously hot squeeze and my girl Juline) I took great pleasure in the artwork they had on display as part of a silent auction fundraiser. Many artists were represented, but if I had to describe a particular commonality between the artwork, I'd say it was heavy on hard lines, colors and graphics. And images like that are particularly inspiring to me... I want to turn the hard edges of designs into soft, wonky stitches onto fabric. 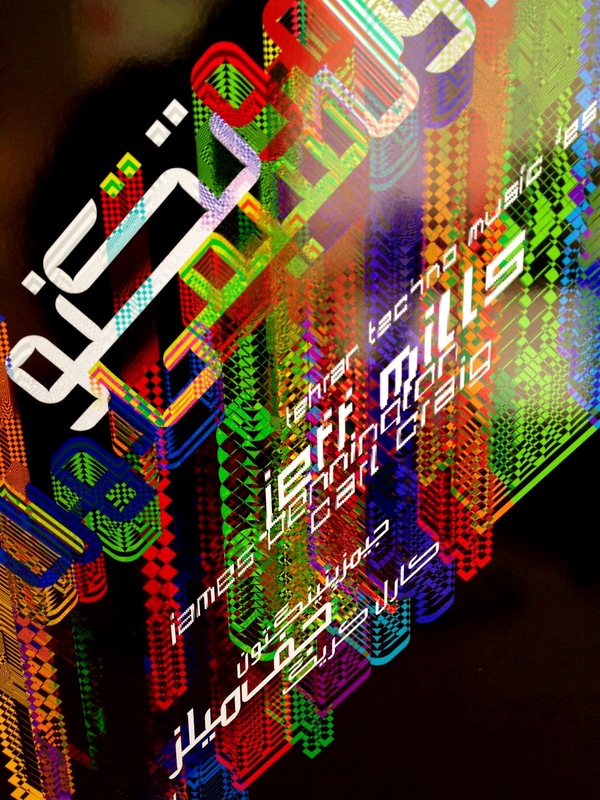 I was giddily surprised that I won the sole auction that I bid on, taking home this wonderful print called "Tehran Techno" by Toronto-based artist Behrouz Hariri. It is simply amazing to have this in my house to inspire me! 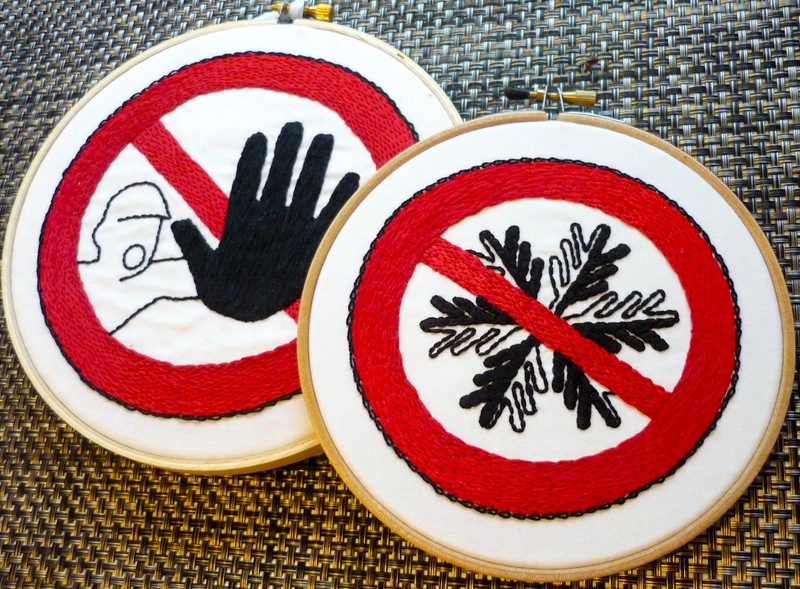 Detail from Do Not Flake on Me, 2012. 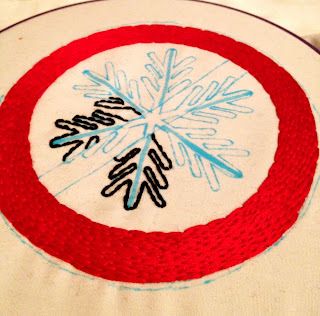 Soft stitching on hard edges. 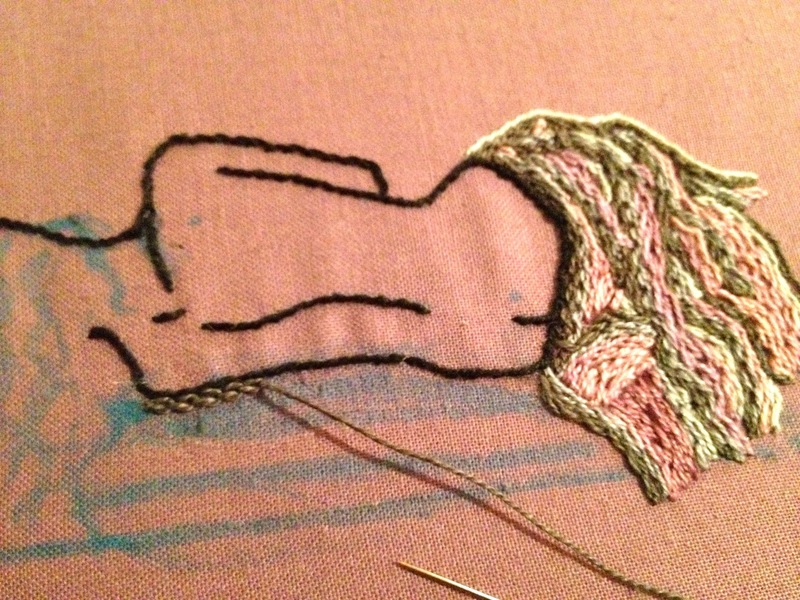 Finishing up my swap piece for the Phat Quarter Spring swap. ALMOST done. Just need to finish a ring of fine chain stitch, wash the piece and hoop it. As usual, I have too many ideas for next projects. Oy! 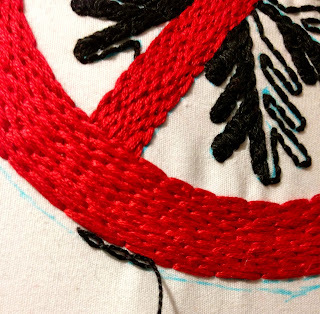 Working (ever so slowly) on a new "Do Not" embroidery. 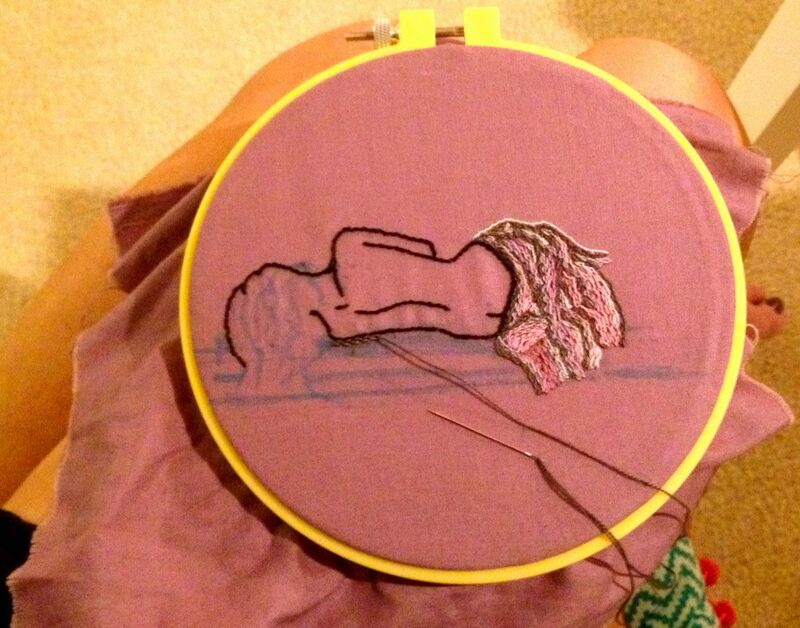 I like to sit on my bed and stitch. This is a created design, not an actual, real life "Prohibited" symbol. I combined the classic red prohibition symbol -- rendered in the red, glossy, thick, brick-like back stitch that I love -- with a slick snowflake design that I found and altered from an out-of-print Japanese graphics book given to me by my fiber arts friend, Naomi, who we call "yarn whisperer." Little Hans, 2011. An altered prohibition sign. I like altering and changing the meaning of hazard symbols. 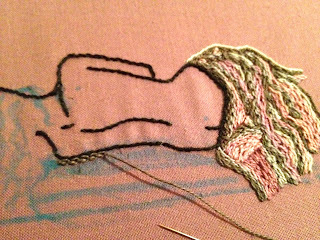 I also like stitching them as is. All in six-strand DMC 321 and 310 on white Kona cotton. 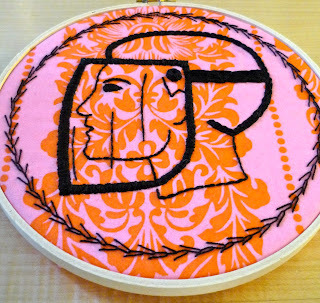 This is for the Phat Quarter Swap on the MrXStitch. The theme of the swap was Spring. 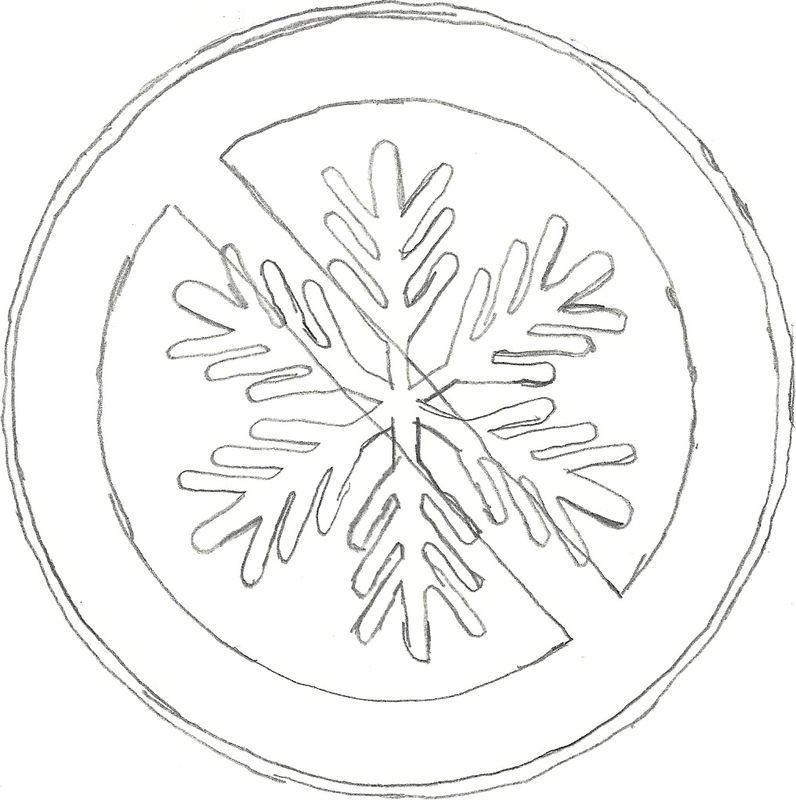 And as I was sketching for this piece it kind of morphed into something new... a warning symbol NOT to flake on me. I'm done with flakey people. Detail of brick back stitch. The piece is for talented Lisa, who promised not to look at my blog while this is a WIP so that she can have a surprise when it arrives at her little studio in Northern California. Now, off to the corporate salt mines.